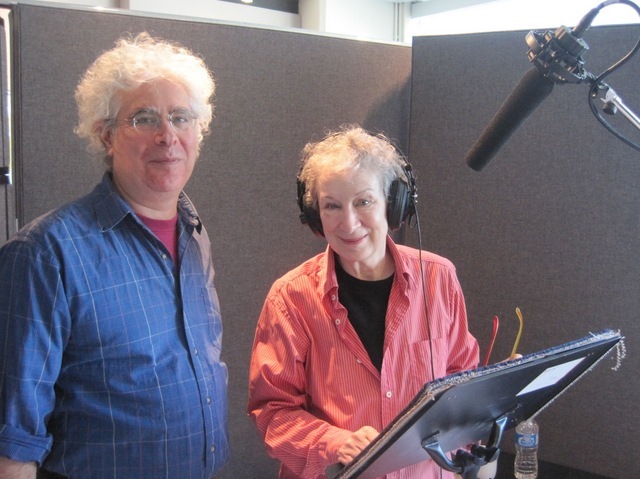 Ron Mann and Margaret Atwood behind the scenes of their new film. As anyone who breezed through Jonathan Franzen’s Freedom since it hit store shelves on August 31 knows, it’s all about the birds, man. From the bird peeking out from the border of the jacket cover to central character Walter Berglund’s quest to preserve the future of the cerulean warbler in North America, in Freedom, Franzen uses birds as a metonym for environmental diversity, and the complications of geopolitics more broadly. It’s a compelling image, and made all the more so by another major novelist’s recent interest in our winged friends. To promote 2009’s The Year of the Flood, Margaret Atwood set out on a lengthy book tour unlike many other lengthy book tours. Instead of zipping from town to town, hunkering down to read selections from her environmentalist dystopian fable and sign autographs, Atwood plotted a trek across North America and the British Isles, mounting a theatrical choral version of her novel. Besides broadening the attention garnered by her book tour (and The Year of the Flood) the elaborate undertaking also raised the profile of the environmental concerns central to the novel, while also raising money for Bird Life International. And she brought veteran Toronto documentarian Ron Mann (Comic Book Confidential, Tales of the Rat Fink, Know Your Mushrooms) along for the ride. Margaret Atwood schools McClelland & Stewart publicist Ashley Dunn on biodiversity. The result is In the Wake of the Flood, which launches this year’s Planet in Focus festival on October 13. A short, but exceptionally intimate portrait of Atwood, Mann’s film metes out footage of her lavish book tour, with scenes of the author futzing about in her garden, bird-watching, and generally appearing to give a damn about the world around her. And while Mann is no stranger to environmental activism—his 2003 doc Go Further followed Woody Harrelson as he bombed around the West Coast of the U.S. in a bio-fuelled bus—In the Wake of the Flood may surprise (and impress) those who have come to regard Atwood less as a social activist and more as an inaccessible institution of highbrow Canadian culture. We talked with Ron Mann last week about birds, mushrooms, and Margaret Atwood’s sense of humour. 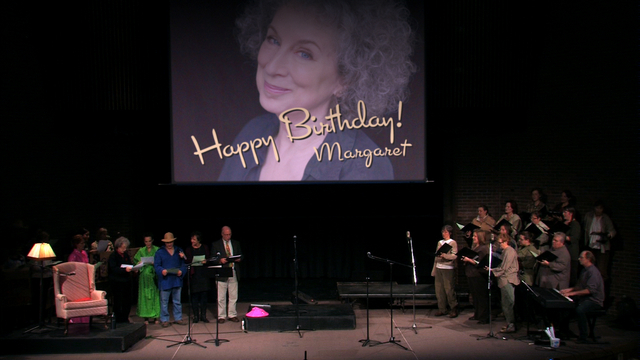 Torontoist: Why make a movie following Margaret Atwood on her book tour for After the Flood? What about the project interested you in particular? Ron Mann: It’s about activism. The way I see movies is that they’re tools. They’re tools for groups to use to help raise money and to raise awareness for a cause. A film like Grass has raised hundreds of thousands of dollars to keep people out of jail. In the Wake of the Flood is a non-profit film. All the money will go to Nature Canada, which is affiliated with Bird Life International. Margaret Atwood’s campaign to raise money for Bird Life International was very similar. The whole project, this particular book tour, came out of a discussion of Bird Life International, about how to raise awareness. Ninety-seven percent of charitable gifts…I just heard this this morning from Margaret, so let me see if I can get it right…ninety-seven percent of charitable gifts go to money in aid of the human condition. Whereas the remaining three percent goes to everything else. And of that three percent, half of it goes to cats and dogs, which leaves one-and-a-half percent for everything else. So why birds? Well it could be birds, it could be fish, it could be almost anything. But the point is biodiversity. Margaret Atwood says in the movie that birds are the canary in the coal mine. I made a movie about mushrooms previously. And I never paid attention to mushrooms, even though I was tripping all over them. Then I went down to the Telluride Mushroom Festival and learned that mushrooms are the network that sustains the planet. It’s a similar thing with birds. I never realized it before, living here in downtown Toronto. But there’s this unseen landscape. I mean, I never thought about it. I was just traumatized by the Alfred Hitchcock film! [Laughs] But Jim Jarmusch, who is a filmmaker and a friend, is a mushroom person and a birder. He has a place out in the woods. He turned me onto mushrooms, first. And then onto birds. So is this the thread that led you to wanting to work with Margaret Atwood on this, making Know Your Mushrooms? Well it was more her book, The Year of the Flood, which is a sort of dystopian speculative work of fiction about a glimpse of where we’re headed and the resistance movement of the Gardeners, this ecological group that is building an Ark for this waterless flood they’ve predicted. It was an environmentally themed book, and I had identified with the Gardeners, and related them very much to Go Further, the film that I made, that had an environmental theme, with Woody Harrelson. That was a road movie promoting sustainable living. And when Margaret said she was going on a book tour, the scope of which was unusual in itself, because it was not in aid of selling more books. Right. It was more about broadening the scope of the very concerns the book deals with. Yeah. And it was for a cause. You know, it was like Go Further with a seventy-year-old activist. And Margaret has always been really rooted in nature. She grew up in…the wild. And was home-schooled. And her father was a naturalist. Yeah, it’s a side that most people probably didn’t know. I didn’t know about her political commitment or anything. Really what I’m doing is echoing her message. Which, really, when I first talked to her, I really knew nothing about. But now, I bought binoculars, and have started bird-watching. 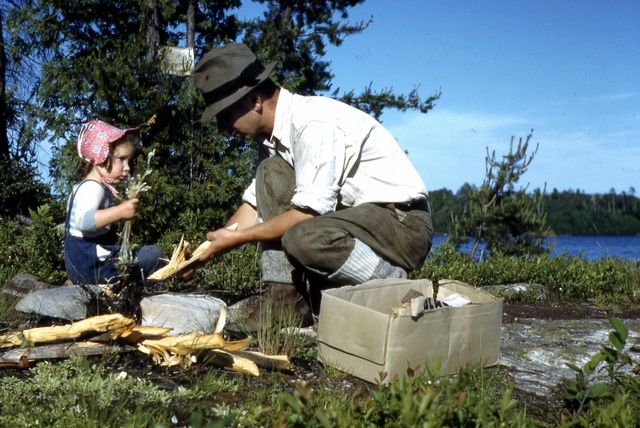 A young Margaret Atwood in the Northern Ontario forests with her father, Carl, circa 1942. Was this always part of your intent, to profile this side of Margaret Atwood? Because apart from getting the message across, the film also serves as a fairly intimate portrait of her life, and especially her life on the book tour. Well my thing has always been to make movies about my heroes. And certainly Margaret Atwood is a hero. Because she’s…inspiring. But do you think it helps to get the environmental message across to render Atwood in three dimensions: to show her at home, and in her garden, and making coffee in her hotel room? You know, so she’s not just seen, at least in the film, as a mouthpiece preaching about birds and the environment? Oh, for sure. I guess what I was trying to say is that the backstory to the actual performance, which you can see in its entirety on the DVD, was…yeah. You’re right. I mean, there’s this tireless seventy year-old with boundless energy. And she’s talking to people about community gardens. It’s an intimate, sort of gentle portrait of her. It is kind…you see her at home, you know? She’s very accessible. She’s very warm. I have to admit that at the beginning of the project I was really worried about the spelling and grammar of my e-mails to her. I’d spend hours composing, like, a tweet or something. But she’s really a very caring person. And she seems to have a good sense of humour, too. Oh yeah. Self-depreciating. And dry. One time I saw her at a fundraiser, for I think This Magazine, and was struck by her sense of humour. But it has this political edge. And at a time when there are no leaders, well, I’d really like to see her run for mayor. She seems to be someone that does, in a very matter-of-fact way, care. I mean she’ll say, “Here are the facts. Make up your mind.” I don’t think she’d call herself an activist. She’s someone who walks the walk but doesn’t talk the talk. Comparing In the Wake of the Flood to Go Further makes a lot of sense. But in a lot of your films you’re very much at the centre of them. Was it a different experience to kind of step back and give it over to Margaret? A performance of In the Year of the Flood mounted in Sudbury, Ontario. Was that because you were nervous about smoking or doing whatever in front of Margaret Atwood? Well, it was more that I wasn’t on a bus filled with smoke! But anyways, I make films that…really I see myself as more as a cultural historian. A lot of this is about giving voices to dissent culture. And Planet in Focus is a good example of that. It’s interesting because Margaret Atwood is such a figure of the larger mainstream Canadian culture that nobody would immediately consider her a voice of dissent. But certainly you have kind of cultivated that reputation. Or a reputation closer to that. Well, the thing is that she’s involved. Just recently she was walking on a picket line to reinstate prisoner’s rights in Kingston: their right to be able to work on farms and provide their own food and get out in the light. Like with Go Further, she’s lending her celebrity to a cause. To draw attention to a cause. And that to me is what boomers aren’t doing. If you read the Esquire article this month, it’s all about how boomers are sitting back, and they’re non-responsible stewards. That’s the message of the film: that you need to be engaged with the world. You still can do something. That’s perhaps the great success of the film, and the tour as well. Because a lot of the time when you hear this rhetoric about “getting involved,” it’s aimed at young people who are more eager and excitable. But here we see Margaret Atwood playing ticketed, catered dinners and speaking to these fancier rooms, as an attempt to speak to this blasé, liberal boomers who really need to be penetrated by this message. And you may hear how today there’s no counterculture anymore. Well, it’s the opposite. There is a counterculture. But it’s unnamed. It’s environmental and social justice networks that make up this huge movement that’s just not named. And it’s really hopeful. But then, you know, there’s the BP oil spill, and you read about that and you get depressed again. The 2010 Planet in Focus festival kicks off on October 13 with the premiere of In the Wake of the Flood. But there’s way more stuff going on than than just a Ron Mann/Margaret Atwood joint. Check out the festival’s website for more details and event listings.